Content Marketing means creating and freely sharing informative content as a means of converting prospects into customers and customers into repeat buyers. The primary goal is to obtain opt-in permission to deliver content via email or other medium over time. Repeated and regular exposure builds a relevant relationship that provides multiple opportunities for conversion, rather than a “one-shot” all-or-nothing sales approach. This content will come in the form of written content with pictures and screenshots, video tutorials and podcasts, email newsletters, free reports, ebooks and more. You use your blog as the main hub of the dissemination of this content. Here are 7 more quick content ideas. 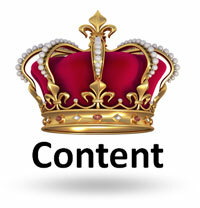 Those having the most success marketing online all use a content marketing approach. They do include direct response marketing in their content too. Create content on your blog that is a perfect fit for a perfect customer. Make a promise of more content to receive permission to continue. This permission occurs when you obtain the perfect customer’s email address. The perfect customer should be able to instantly receive this content after submitting their email. Although the content made available beyond what is published at your blog, it is congruent, and serves as a next step. Deliver on what you promised. Then over deliver on the value you promised. When you capture the perfect customer’s email address, you’re building your list. Your list is a valuable asset. Have something to sell. If you’re given permission to send more perfect fit content, sooner or later you’ll want to send them something that costs money to obtain. This is called monetization. And if you continue to send even more perfect fit content, the combination of trust and exposure will sky rocket and you’ll have more opportunities to monetize. This is where you’ll integrate direct response copywriting. The reason is simple. Content will always be the number one thing that drives the Internet. People are looking for good information. That information solves a problems, and makes life less painful. People aren’t looking for immediate sales pitches. Content marketing will knocks down sales resistance. It also can be an introduction to the benefits of a particular product or service you offer later. That’s how you can begin to make money with a content marketing marketing system. Need More Details About How To Start? Here are 133 ways to differentiate your business and products online ALL using various approaches of content marketing. Even if you’re working primarily offline. Also, you’ll want to discover the two part content formula that helped Ann increase her business from $3K to $90 to $250K per month. It’s all “in there” and it’s free. These 7 steps are key but step 4 is key. I have often given out my email address and didn’t receive the promised information. Which make the marketer lose credibility with me.